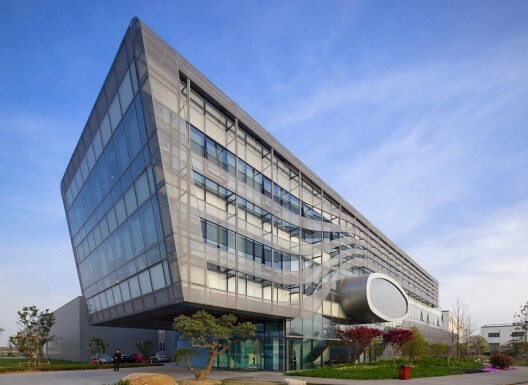 The Envision Energy Headquarters, designed by AECOM, is located in Jiangyin, Jiangsu Province, China. Envision Energy is the leading Chinese wind turbine manufacturer that emphasizes in research, development, manufacturing, sales and maintenance. The new 3-story 3,000 square meter facility is a mixed use, multi-layered space which includes program of offices, dining facilities, galleries and exhibition spaces, an employee recreation lounge with karaoke room, theater, gym, massage room and game room. The facility supports all employees from skilled laborers to executive directors and encompasses the attitiude of the company, celebrating wind energy as the fastest growing clean alternative energy solution. The architects were asked to design the facility to express this technology. Wind energy and movement were the formal inspiration for the building's massing, facade and interior organization. The building is composed of two glass volumes that sheer along the north/south axis, forming a 10-meter cantilever that marks the main entrance. 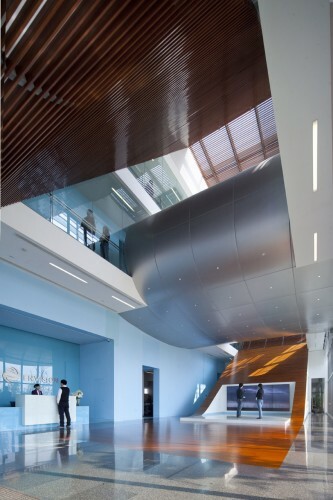 Using the company's blue logo, AECOM branded the interior of the building using the same palette to create the association between the architectural space and the product. 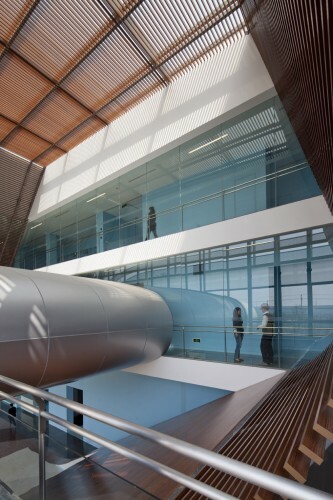 The passage of air "sculpts the interior of the building, carving an atrium space, which is flooded with light, from the main entrance to the inner program of the headquarters." The facade is composed of a perforated metallic skin that functions as a solar veil. " 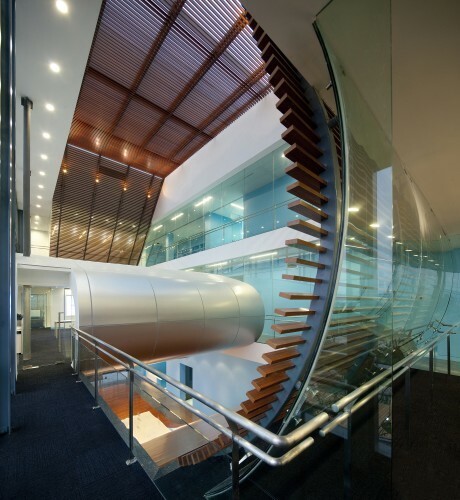 Both sections of the bisected exterior skin flow around a crucial design feature — the central, airfoil-shaped "Envision Eye" which links the headquarters to the adjacent assembly facility. This connection relates the two buildings to one another without compromising their distinct identities and functions," write AECOM. Exhibition and curation is a key conceptual component of the design which is carried out through the coordinated circulation through the headquarters that informs visitors and employees of wind turbine technologies and renewable energy. The exhibition includes Envision's products, operations, monitoring and fabrication. Visitors are also given the chance to see how monitors track Envision's turbines. In this way the facility functions as an educational tool, giving visitors insight into the operations of the facility and the global impacts of wind turbine technology.